Personalized Custom Name Initials Embossing! This is the perfect gift idea for a loved one as a birthday, graduation, wedding, anniversary, or holiday present. Gift wrapping and gift message are available. Embossing Info: We only use capital letters. Aluminum die letters are heated and pressed onto the leather to blind emboss the initials. Please do not use any special characters. English alphabet only. Item non-returnable unless specified by special condition. 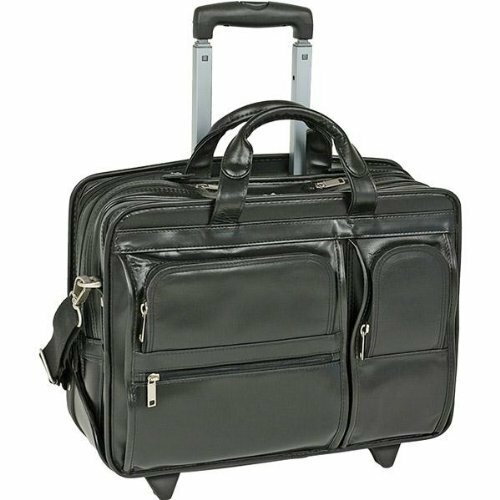 Patented 2-in-1 Detachable Wheel and Handle System.Two front organizer pockets for media devices, cell phone, business cards, key chain holder and pens. Front compartment with accordion file for all your document needs. Back compartment padded to protect most laptops up to 17? in size. Front zipper pocket provides access to small miscellaneous items.